1Source Safety and Health, Inc. is focused on helping clients with emergency and non-emergency safety and health issues as related to buildings and occupants. Our company has a diverse staff of professionals certified in industrial hygiene, safety, ergonomics, and audits. Our expertise in consulting and litigation support is in mold, indoor air quality, industrial hygiene, development of safety programs, noise assessments, training programs, environmental disease, Legionnaire disease, construction safety, OSHA, OSHA VPP, ergonomics, asbestos, audits and workers’ compensation. 1Source Safety and Health, Inc. has expertise from the initial investigation of identifying the issues, causation, and sources through the development of expert reports, depositions, arbitration, and providing expert testimony in court. As a leader in safety and health consulting, 1Source is committed to developing long-term, mutually beneficial professional relationships with our clients and business partners, while creating a challenging and rewarding workplace for our professional staff. Consultation and management in a broad spectrum of safety and health services and issues as they affect facilities and the people within the building environment. Beneficial relationships are key to everyone's success. Therefore, we have chosen to align our expertise with that of board-certified occupational health physicians, engineers, restoration and remediation experts, environmental consultants, insurance companies, health physicists and equipment suppliers to better serve and address the needs of our clients and those clients of our business partners. Our success is based on fostering and developing long-term mutually beneficial professional relationships with our clients and our professional staff by investing in the resources that will maintain our position as the regional leader and provider of safety and health consulting services, with nationally recognized expertise. 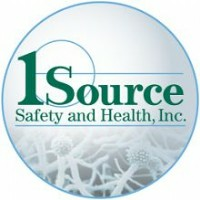 About 1Source Safety and Health, Inc. Contact 1Source Safety and Health, Inc.
All the safety and health expertise you will ever need is now available through 1Source Safety and Health Inc. The core business is safety and health management and consulting for educational, insurance, commercial, residential, research, healthcare, and manufacturing facilities. Our team of professionals includes certified industrial hygienists, certified safety professionals, certified professional environmental auditors, and a certified professional ergonomist who can address every safety and health issue. One key measure of their success is that 1 Source Safety and Health, Inc. is the largest safety and health consulting firm with the most certified staff on the east coast. This is primarily the direct result of the commitment to the client philosophy and the diversity of experience and expertise of the team. For more than 20 years, professionals in our team have been committed to developing long-term, mutually beneficial professional relationships with our clients and business partners. As needed, our experts may recommend the involvement of a board certified environmental health physician, or a professional engineer to assist in supporting cases that require additional expertise. Denise M. Proulx, CIH, Sanofi-Synthelabo, Inc.